Price just reduced on this gorgeous property! 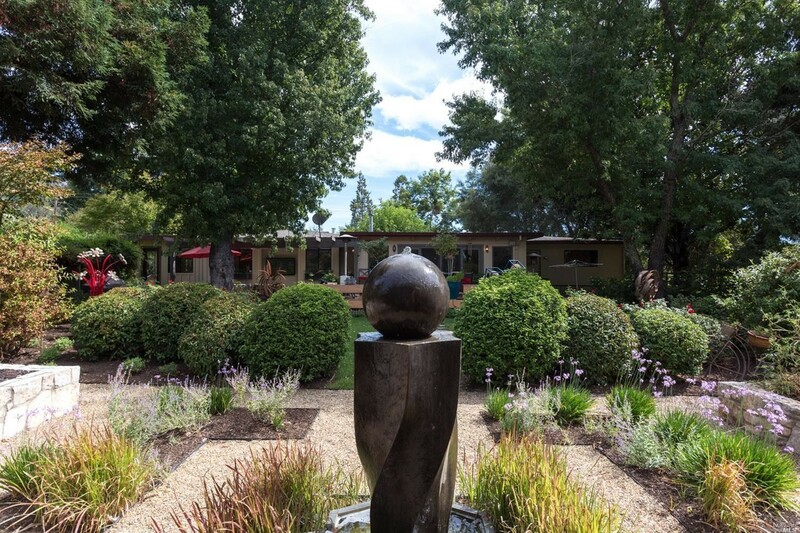 Beautifully landscaped 1 acre parcel featuring Zen gardens plus Cabernet and Merlot vineyards! 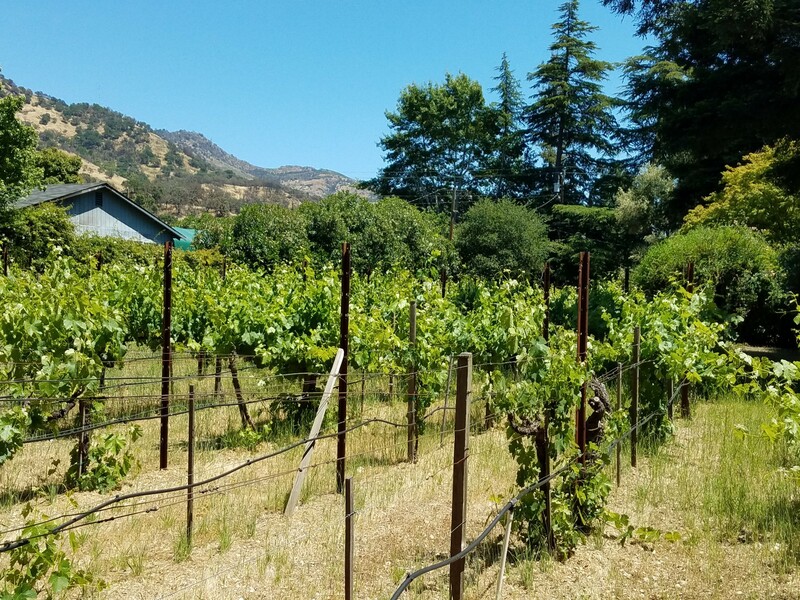 This is the property everyone says they want when they think of a home in wine country! 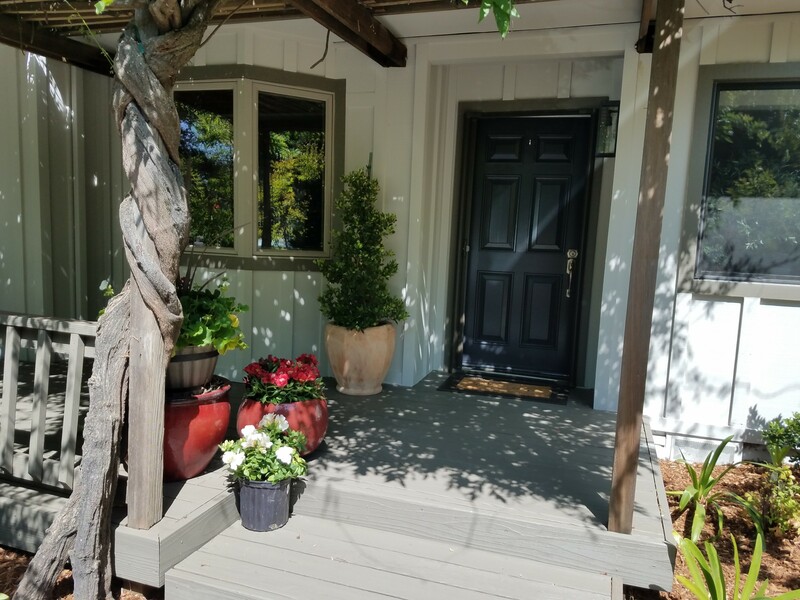 The country casual remodeled California ranch-style home with wide open floor plan is perfect for entertaining large groups or intimate family gatherings . 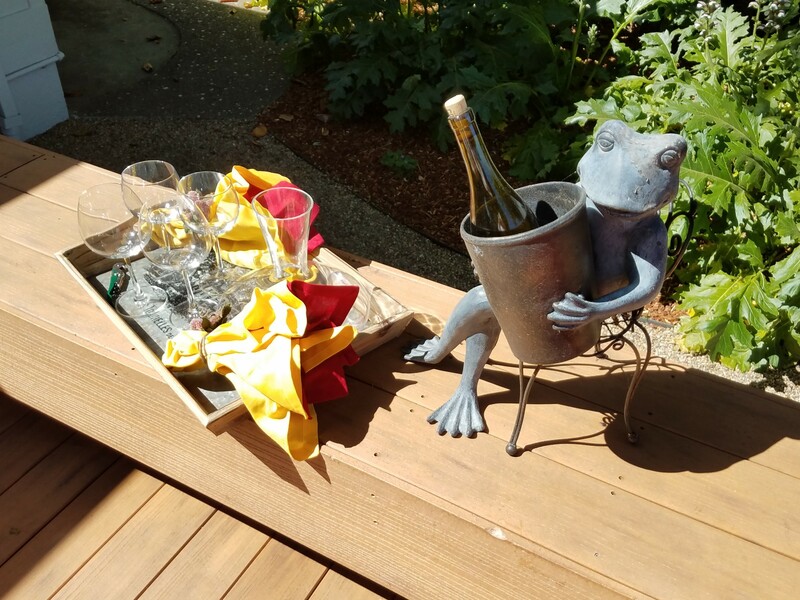 Step out through the glass slider onto a large deck that overlooks the enchanting garden, with sculptured fountain, flagstone and granite walkways, raised garden beds, and a vine covered pergola for shaded outdoor dining. 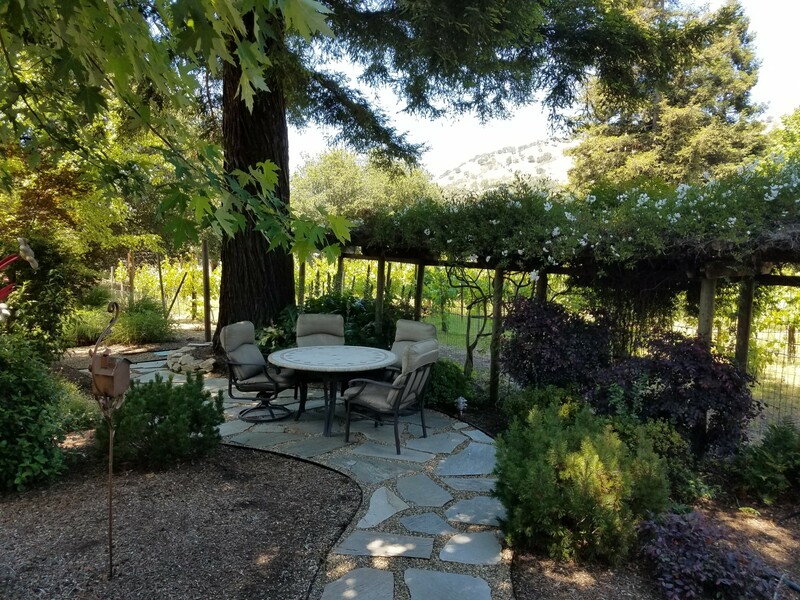 surrounded by vines on two sides, your privacy is almost guaranteed , plus there is a vacant parcel to the back that is bordered by mature trees. 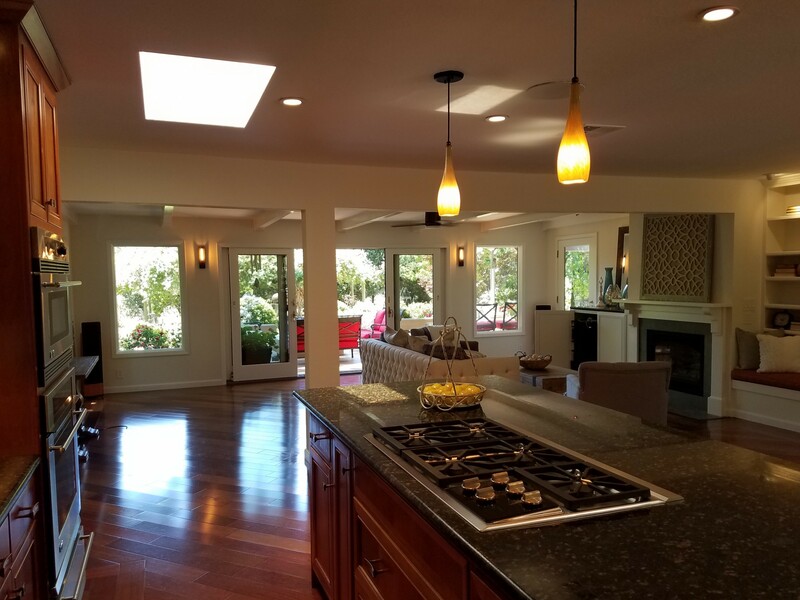 Inside the home, the remodeled kitchen offers high-end appliances, including a Wolf gas cook top, a Bosch dishwasher and a wine/beverage refrigerator. 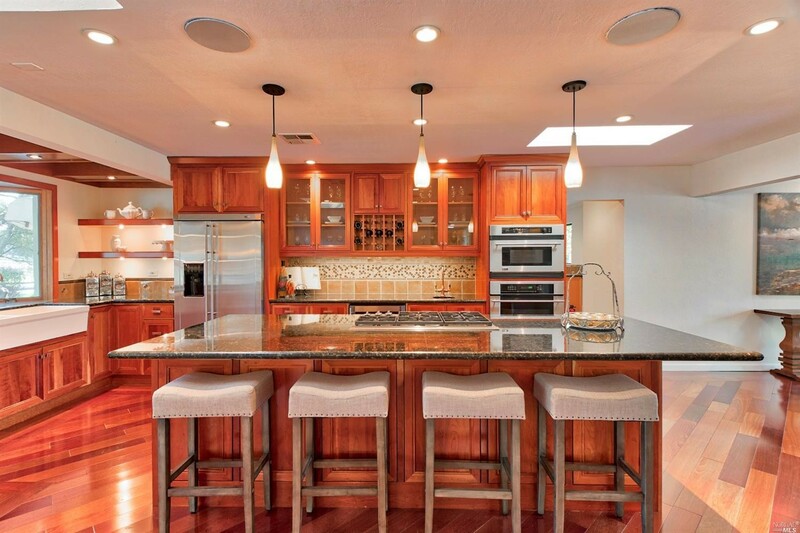 The large island is covered in attractive granite and has room for six seating for informal dining or entertaining while the Chef prepares dinner. 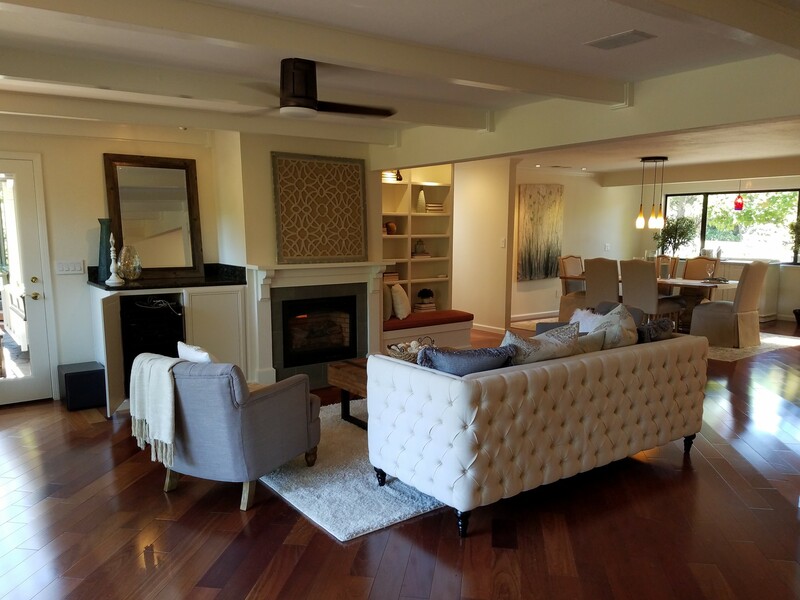 The great room has a formal dining area and ample room for seating around the fireplace. 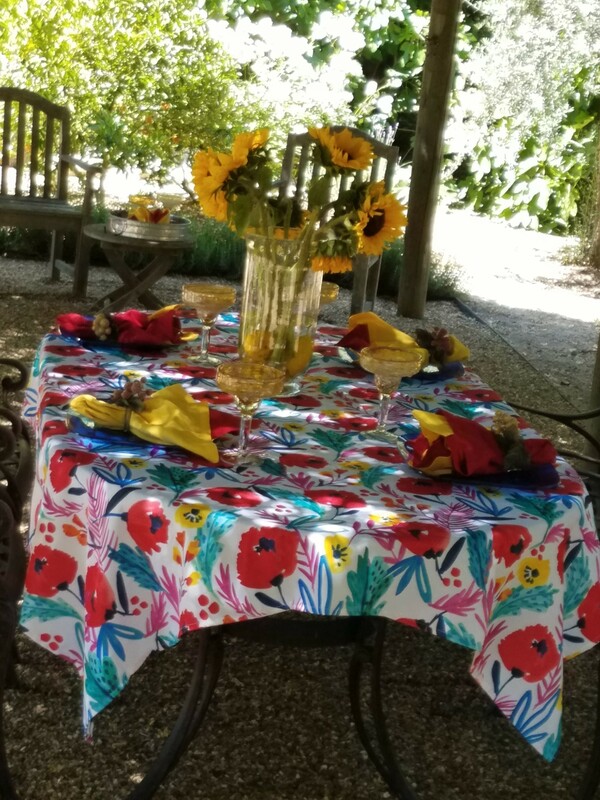 Set up a game table in the living room for activities when you cannot be outside enjoying the beautiful gardens. 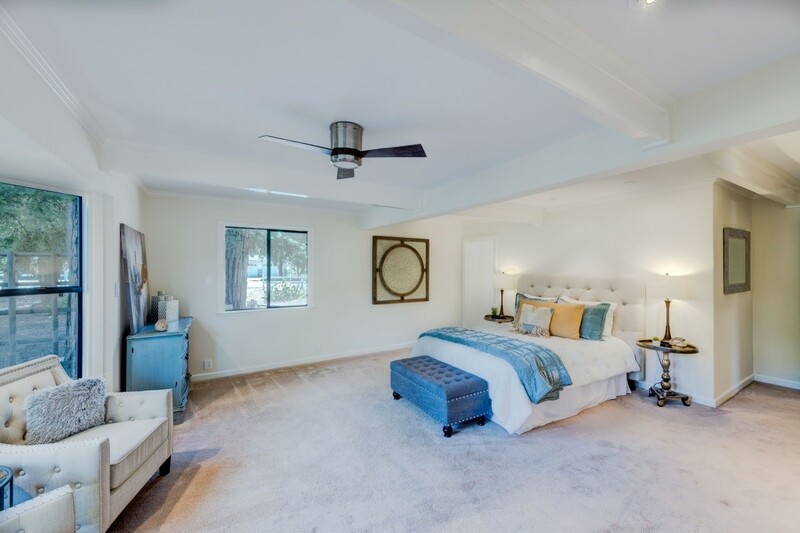 The ample master suite is luxurious and features a beamed ceiling and two closets, a lavish master bathroom, and access to the retreat or home office. 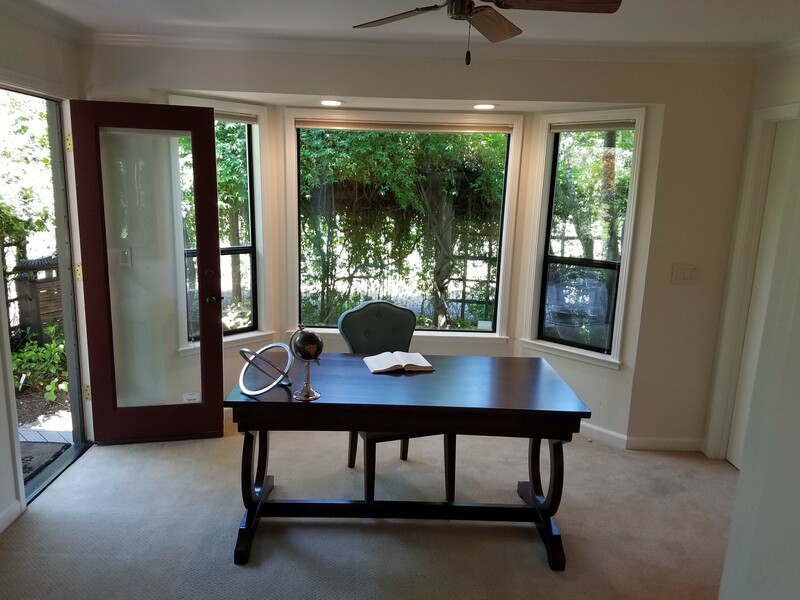 The office has its own outdoor access, and could be a small 4th bedroom. The great room features an electric fireplace to snuggle around on chilly fall & rainy winter nights. 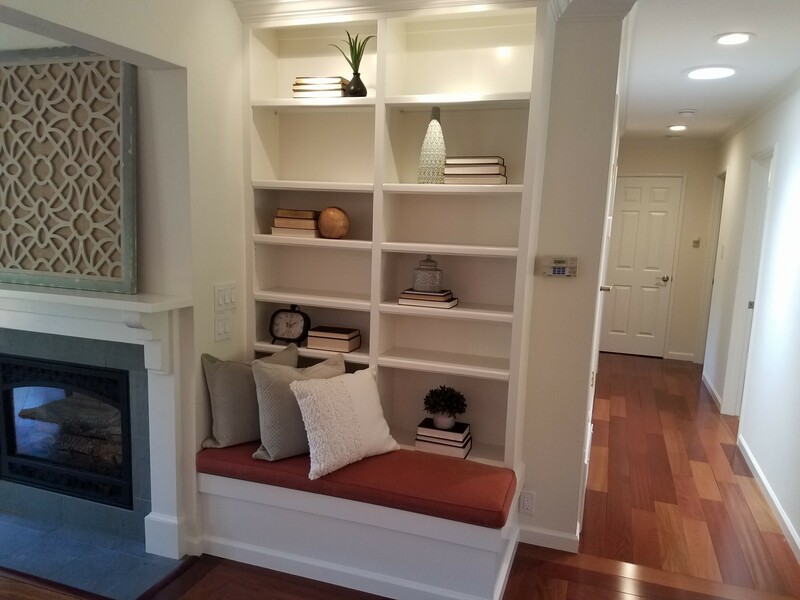 Detail of the display shelf and bench seat next to the fireplace. 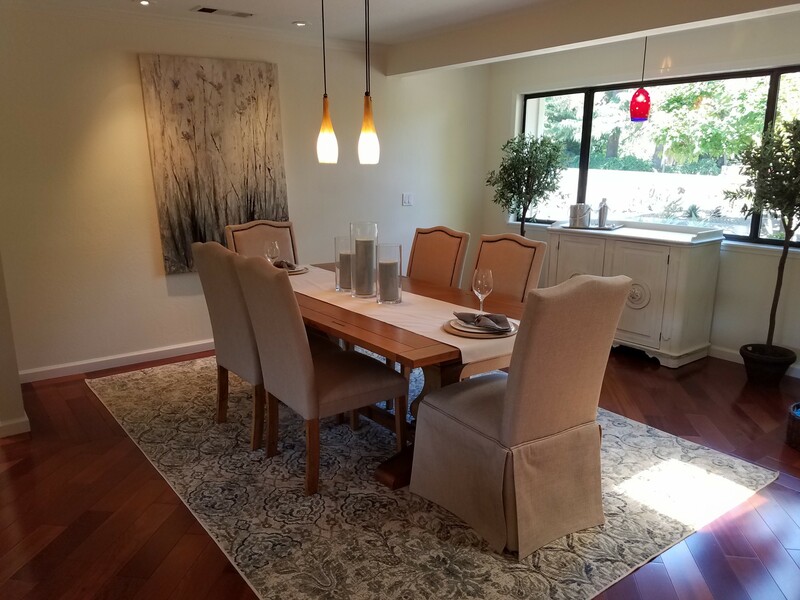 The dining area is set conveniently adjacent to the kitchen and living area. 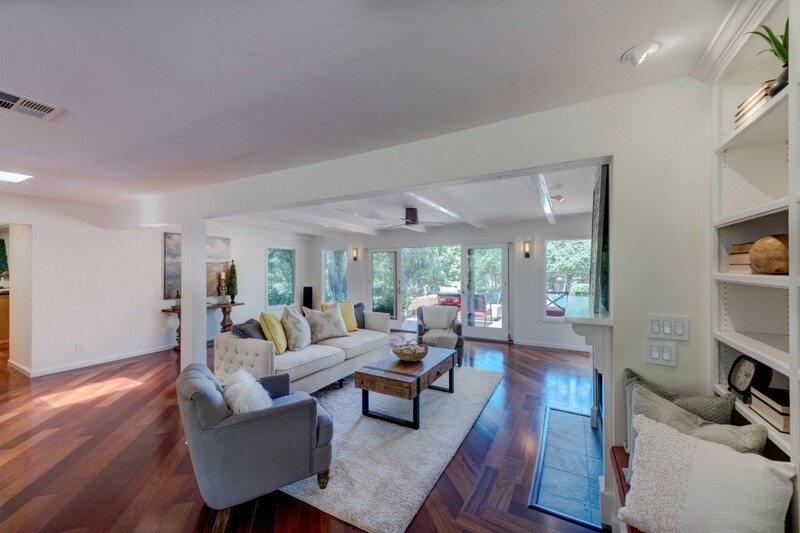 The flow for this home is perfect for casual or formal entertaining. 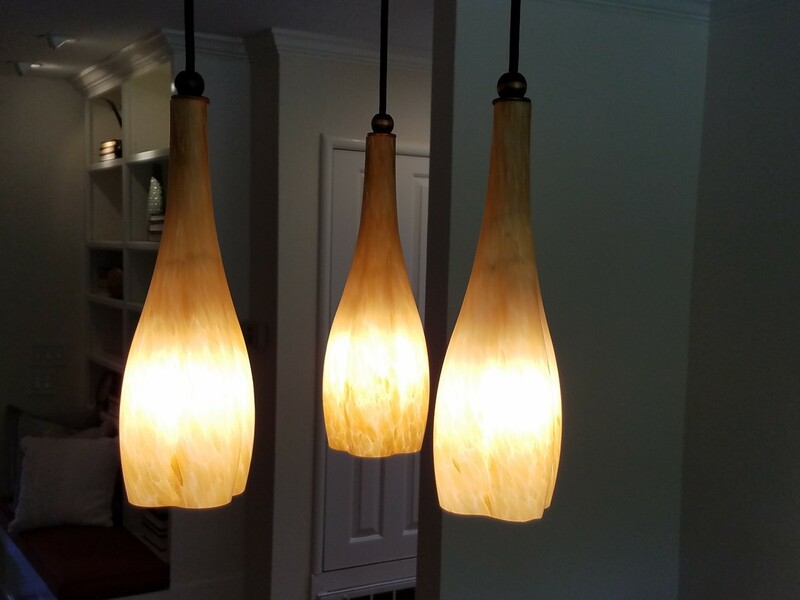 Detail of lighting fixture in dining area. 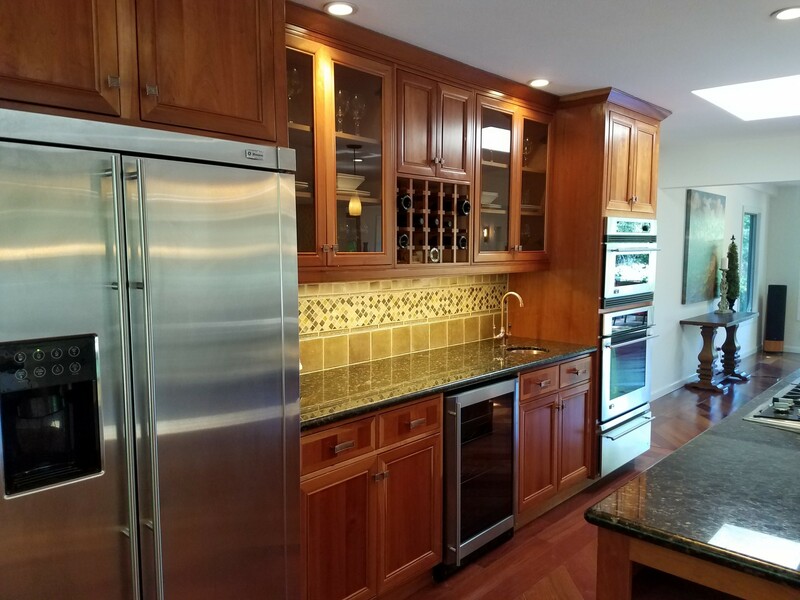 The beautifully remodeled kitchen features a large center island. 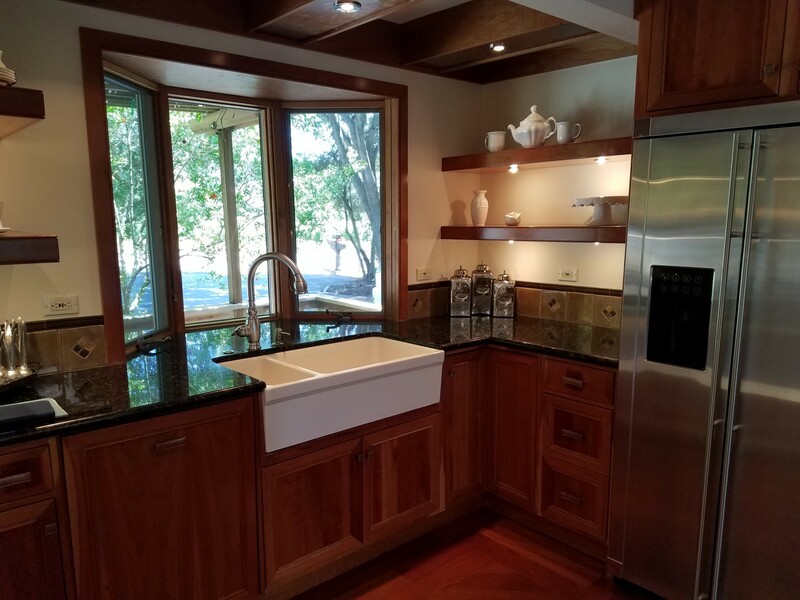 The island as well as the counter-tops are of beautiful granite slab. Stainless steel appliances include a Wolf cooktop , GE Monogram refrigerator & built in oven/ microwave, plus a copper prep sink. 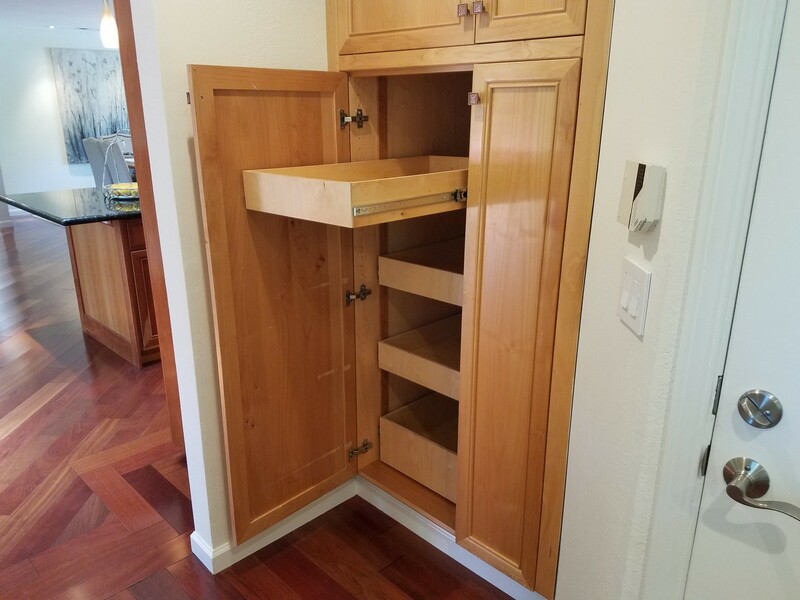 The Bosh dishwasher is cleverly hidden behind a cabinet front door. 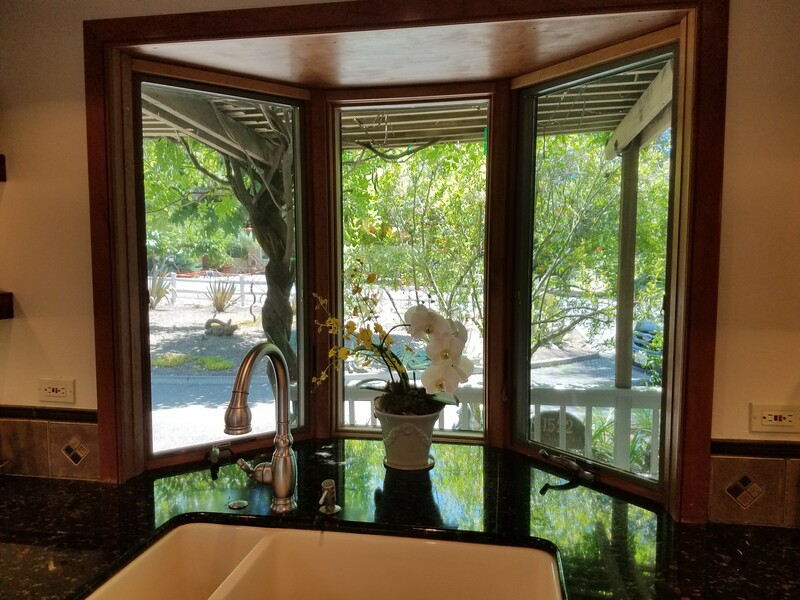 A farm sink looks through the bay window. 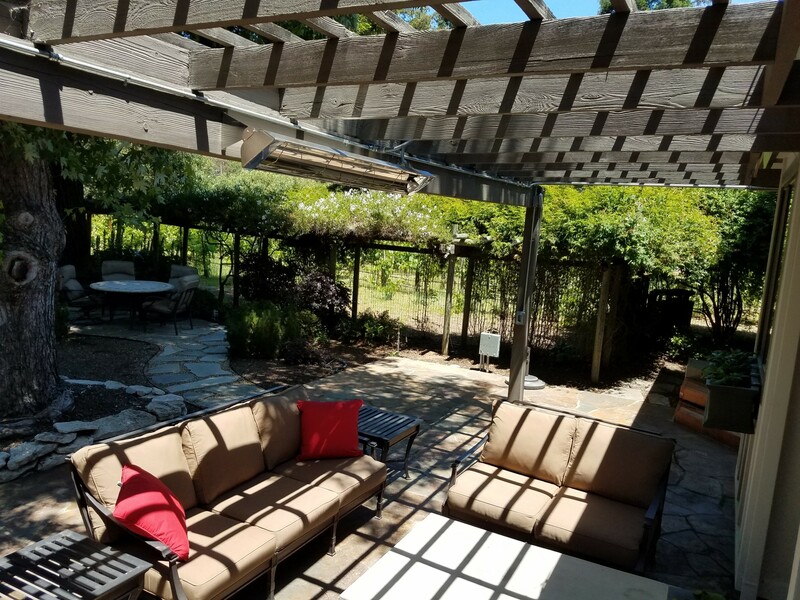 View from the kitchen out to the front porch pergola that is shaded by mature vines. 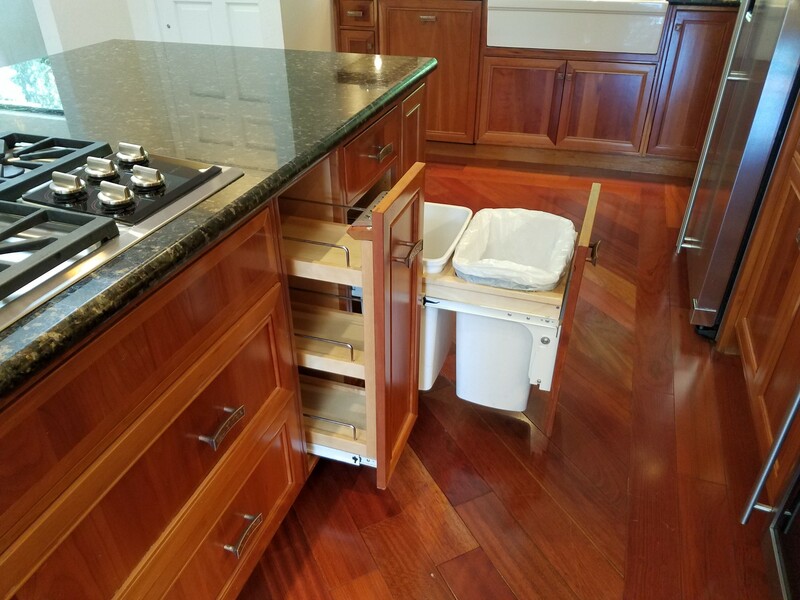 The cabinets are thoughtfully planned to include pull outs and even a recycle center. View to the living area and the beautiful outdoors from the kitchen. 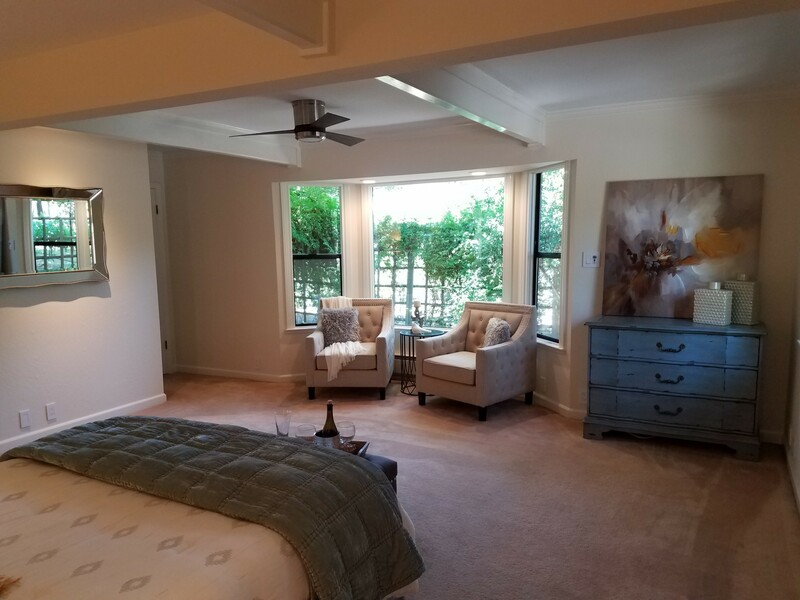 The master bedroom features a cozy seating area in the bay window that looks out onto the Zen garden and Merlot vineyard. Master bedroom showing entrance to master bath and closet on far wall. 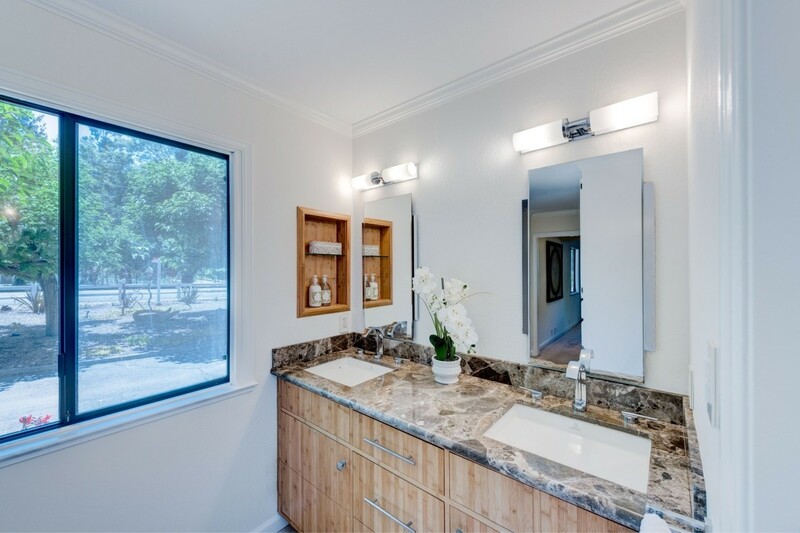 Light and bight master bath vanity area. 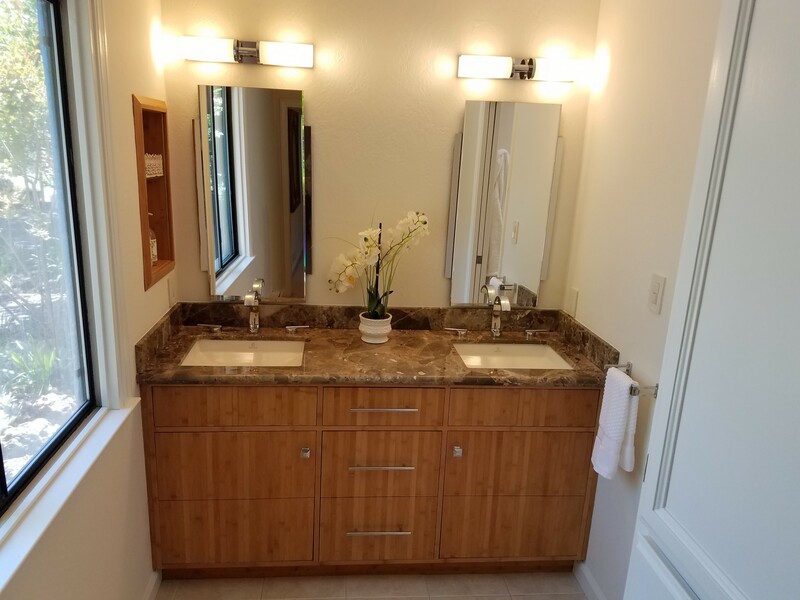 The master bath features a tile floor, bamboo cabinet and twin sinks in the marble vanity. 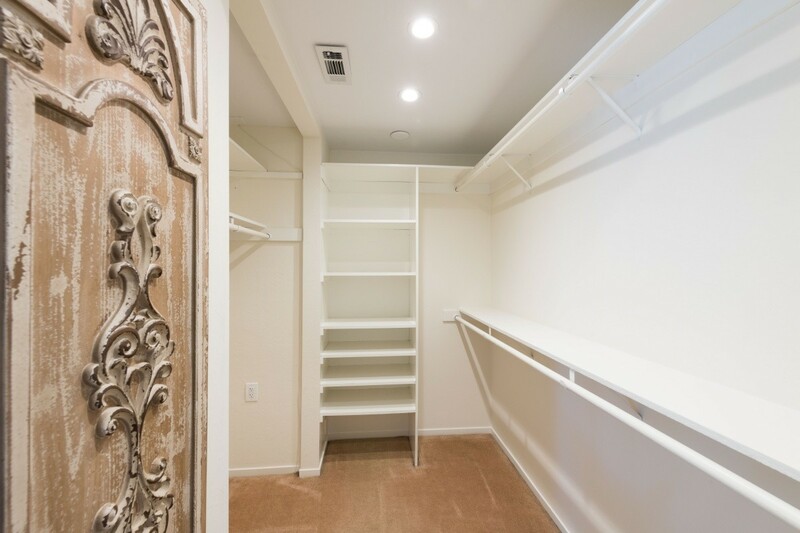 Walk-in closet in master bedroom. 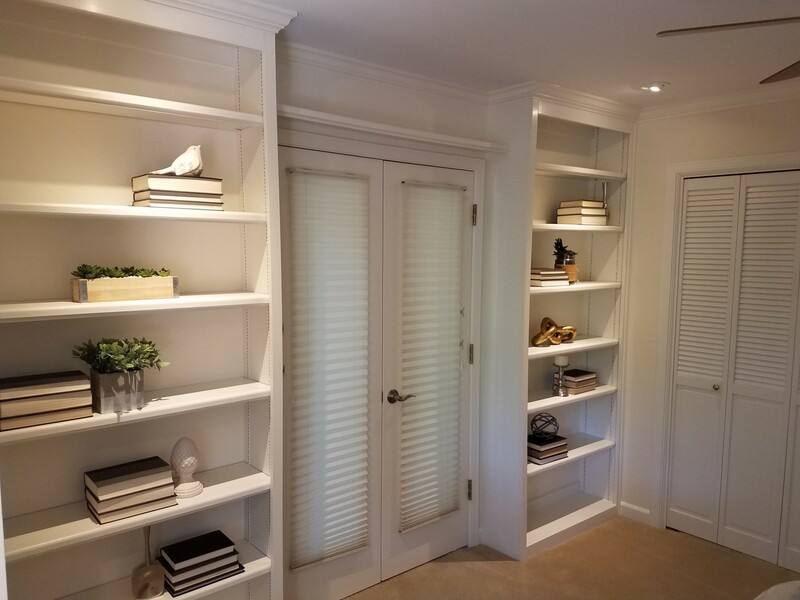 This is one of two closets in the master. 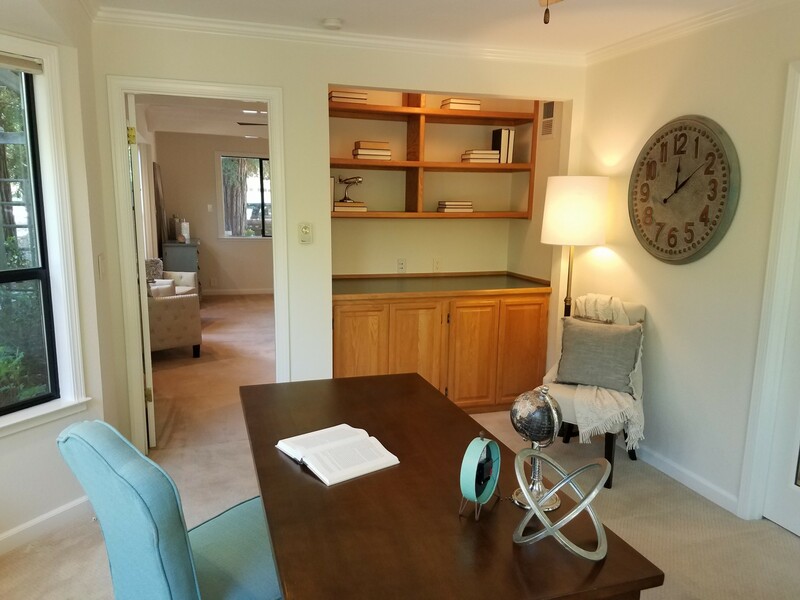 Office built-ins and entry to master bedroom. 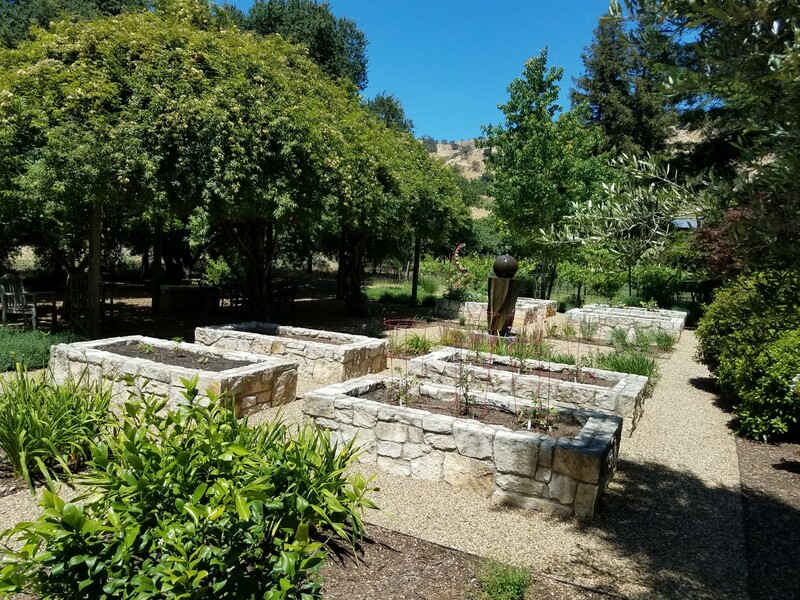 The Zen garden and walkway from front to back of home, right next to the Merlot vineyard. 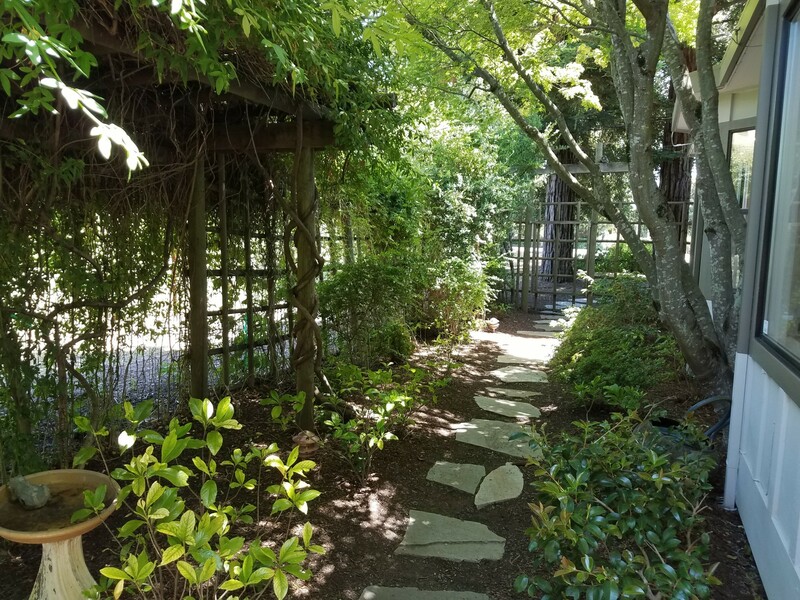 Flagstone path leading from the front of the home to the gated Zen garden. Gate to access backyard from front. 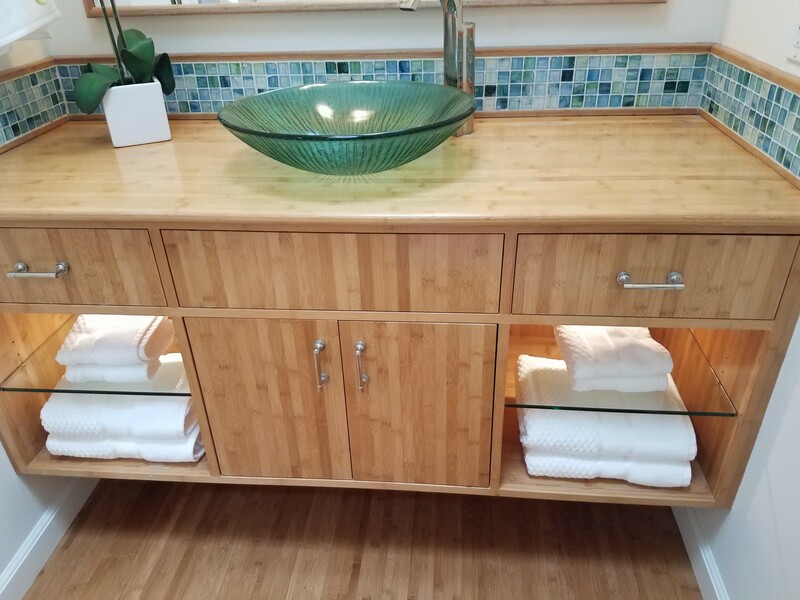 The guest bathroom has a bamboo floor, cabinet and counter-top. 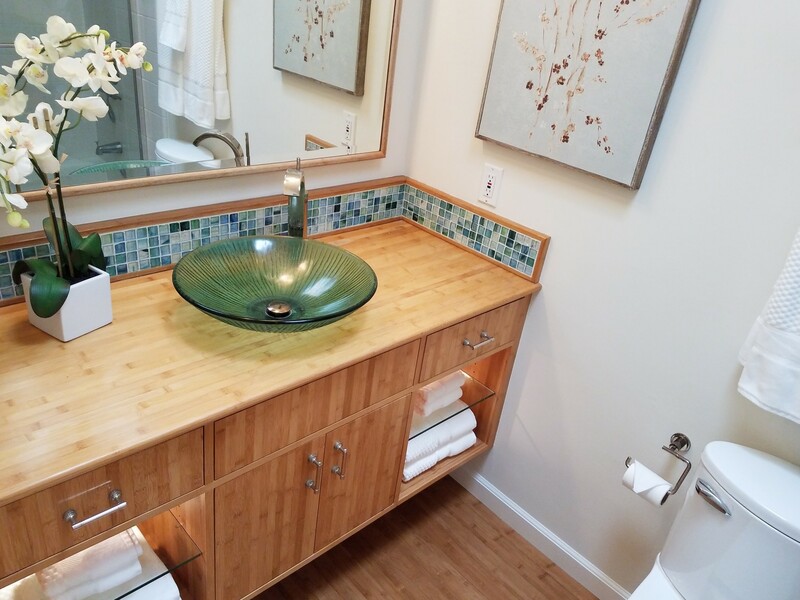 Detail of the cabinet that features lighted glass shelves and the Asian influence glass sink and faucet. 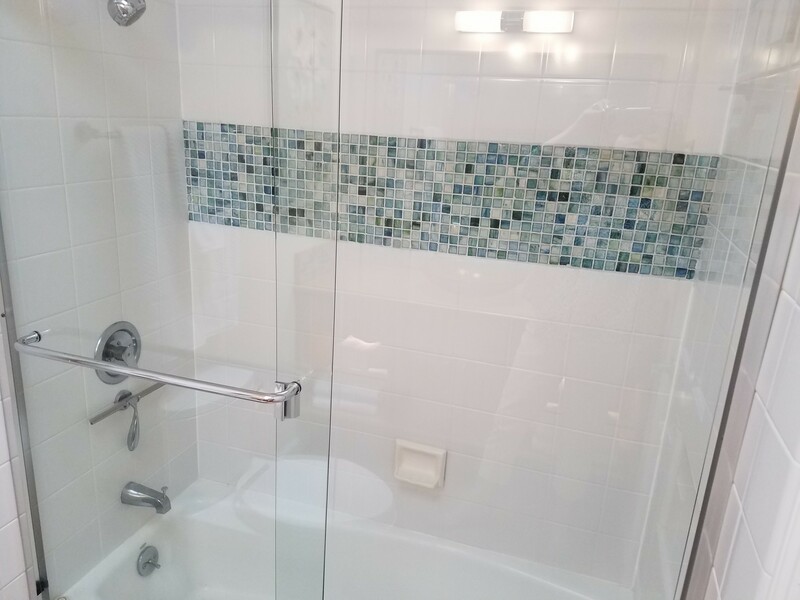 This bathroom has a tub and shower with glass doors. 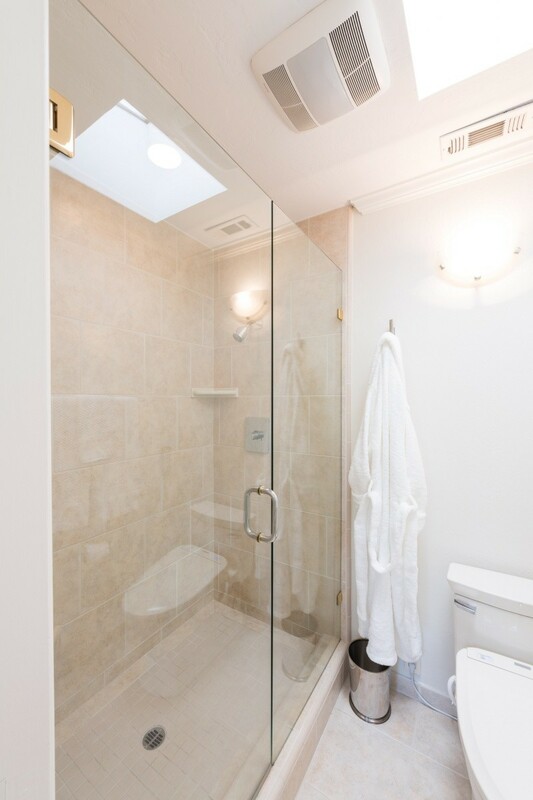 There is also an opening skylight in this and the master bath. Now let's venture outside through the large Anderson sliders and onto the large entertaining deck. 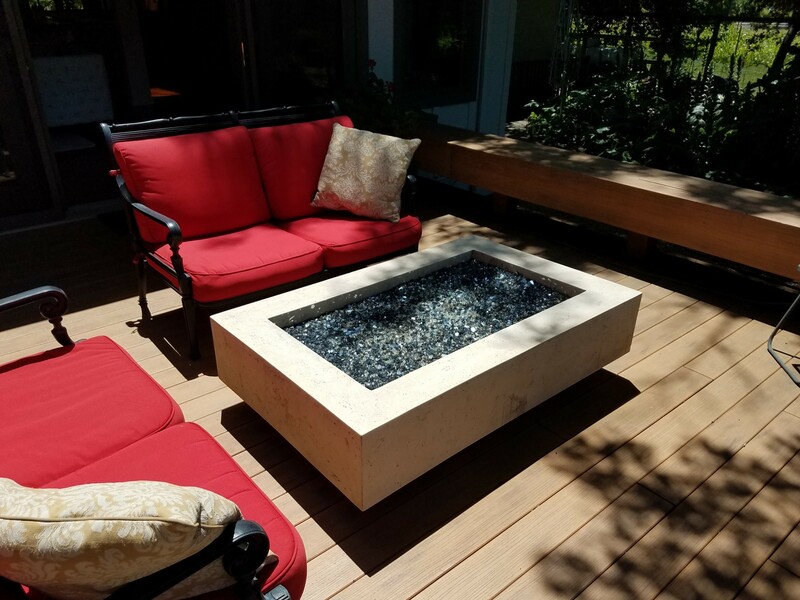 The deck is ironwood and features a gas powered fire and ice fire pit, plus bench seating. 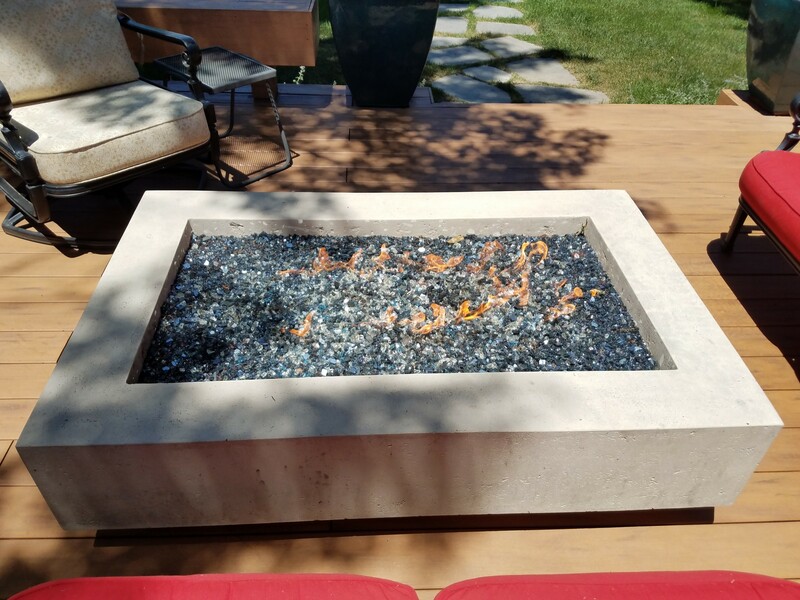 Keep the chill away on cool evenings by sitting around the fire and ice propane powered fire pit. 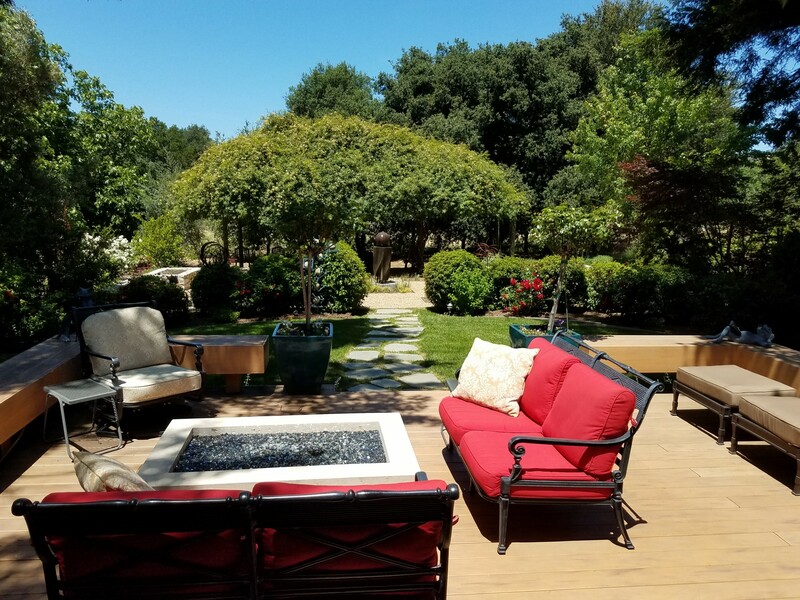 Sit around the romantic firepit , enjoy a glass of wine or two, and listen to your favorite music over the outdoor speakers. Wine by the fire pit. Covered seating area that features a flat screen TV and heater overhead. 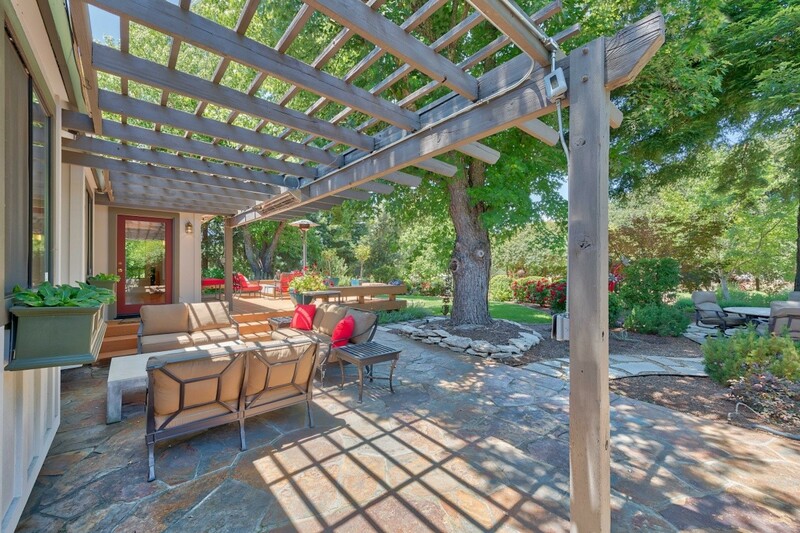 Perfect spot for watching your favorite sport or catching the evening news. 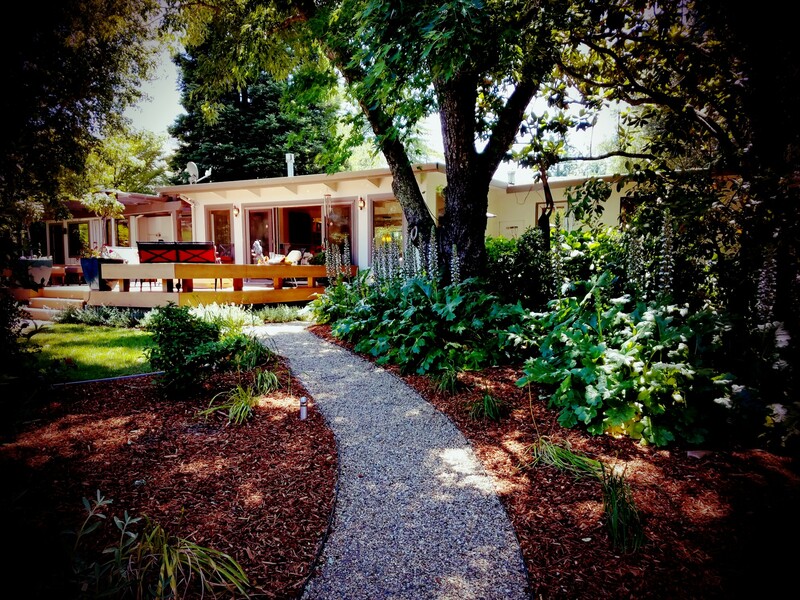 Plumbing for an outdoor kitchen is just beyond the TV viewing area. : Water, propane and electrical all in place. 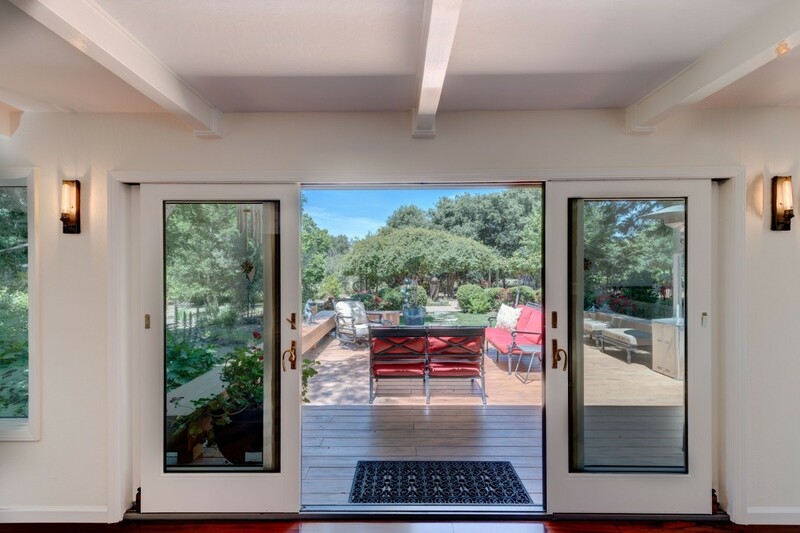 To the right of the deck is a flagstone patio set under a mature redwood tree. 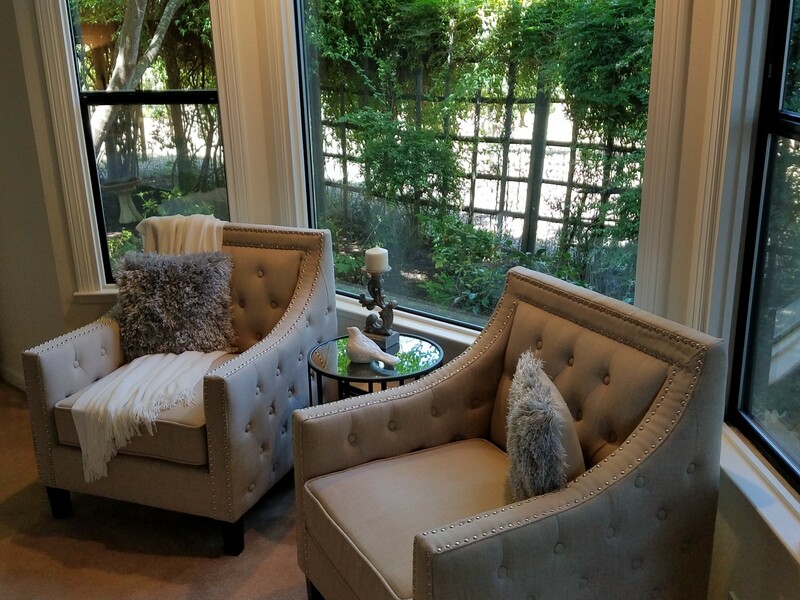 This secluded little nook would be a great place for a spa! 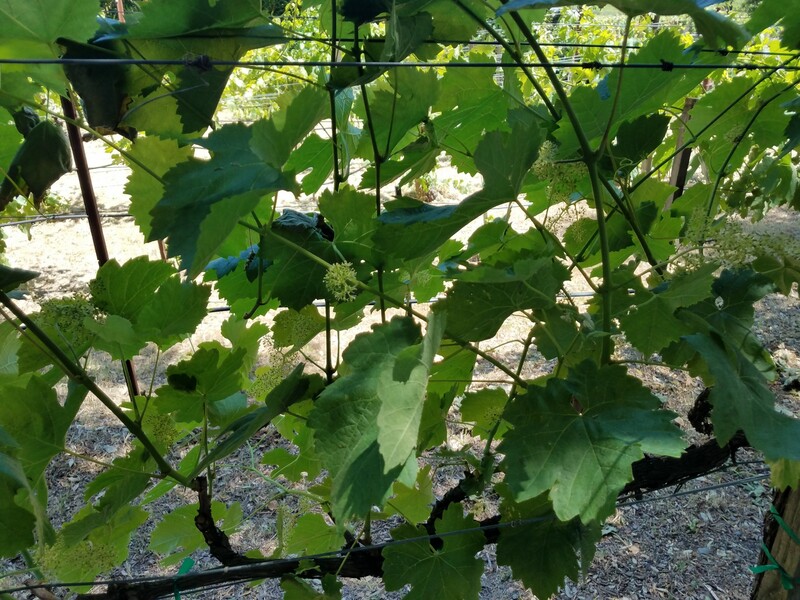 The Merlot vineyard is just to east of the flagstone patio. It features views of the eastern hills. 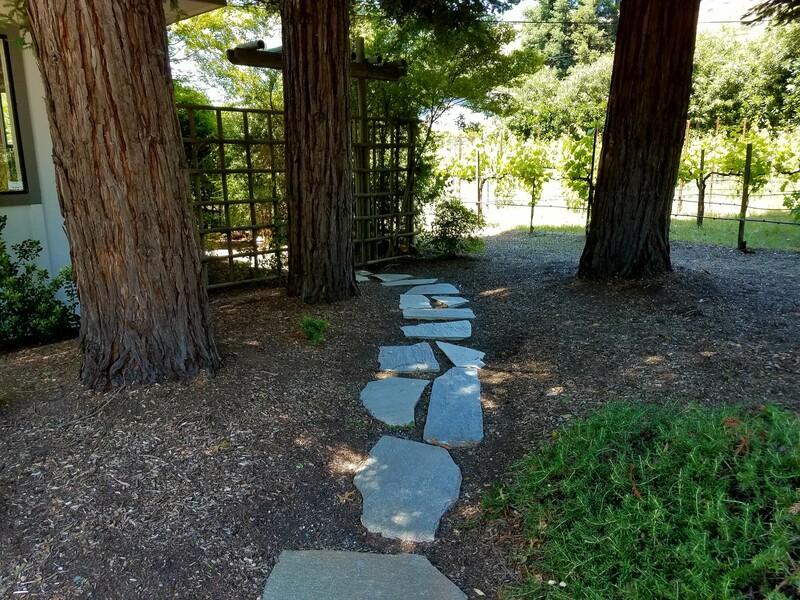 Pathway to the Cabernet vineyard. 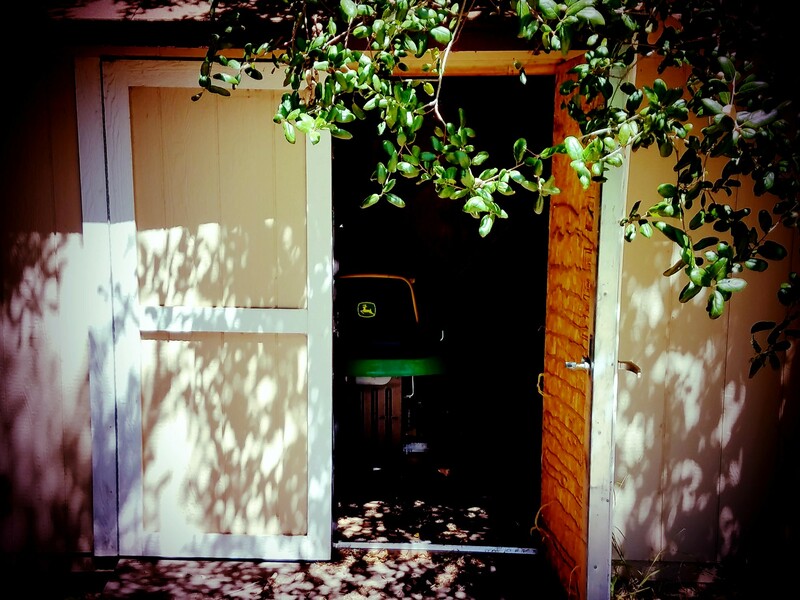 Storage shed with John Deere riding mower included. Continue along the path to the lushly landscaped backyard with meandering paths, all presided over by a soothing sculptured fountain. 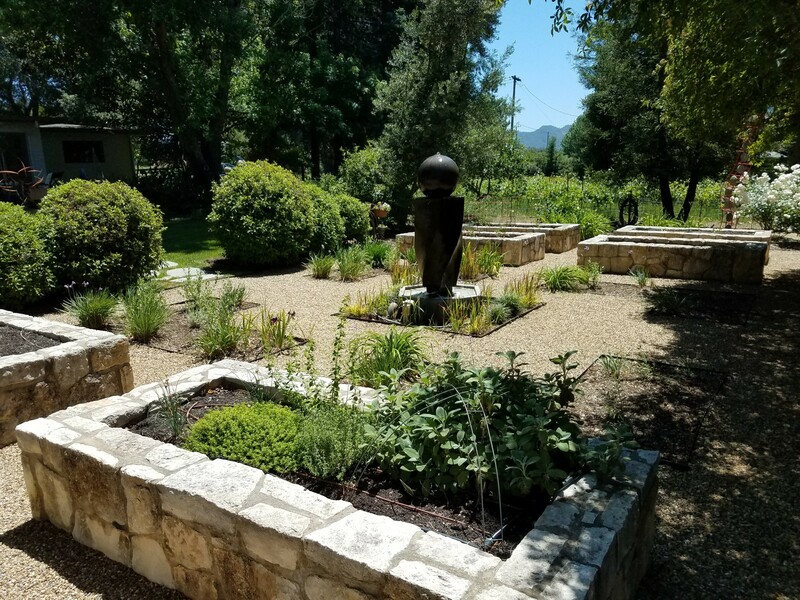 Surrounding the fountain are eight raised stone planting beds, on drip, for raising herbs, vegetables, flowers or whatever pleases you. 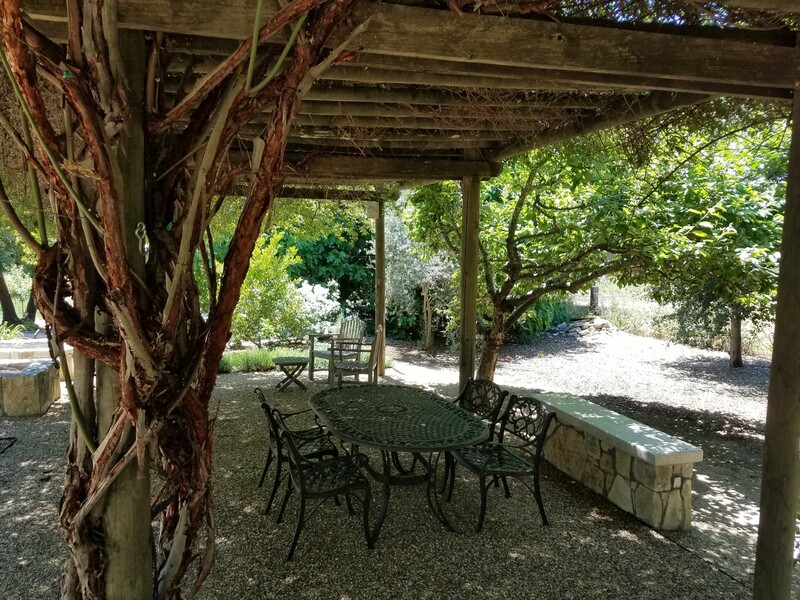 Directly behind the garden beds at the back of the property is an ancient-vine covered pergola, offering the perfect setting for outdoor dining. Pergola ready for lunch and Margaritas. 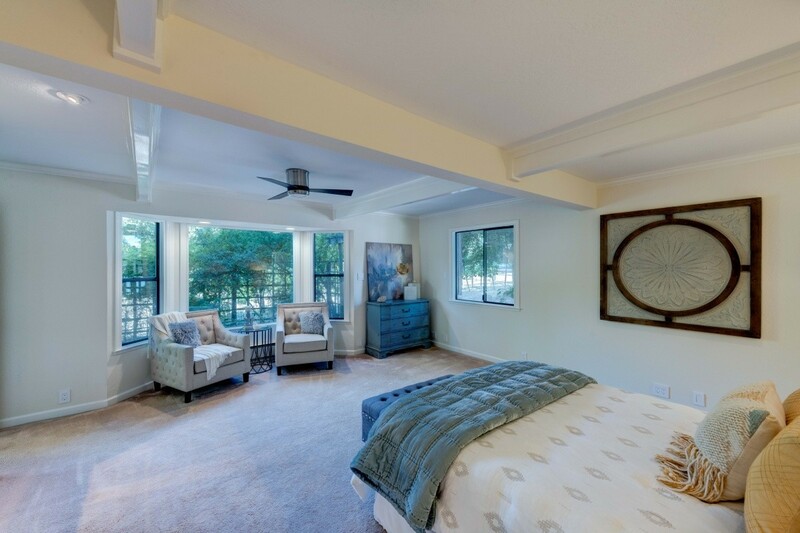 Back in the house, the third bedroom with built-in book cases and view to back yard. 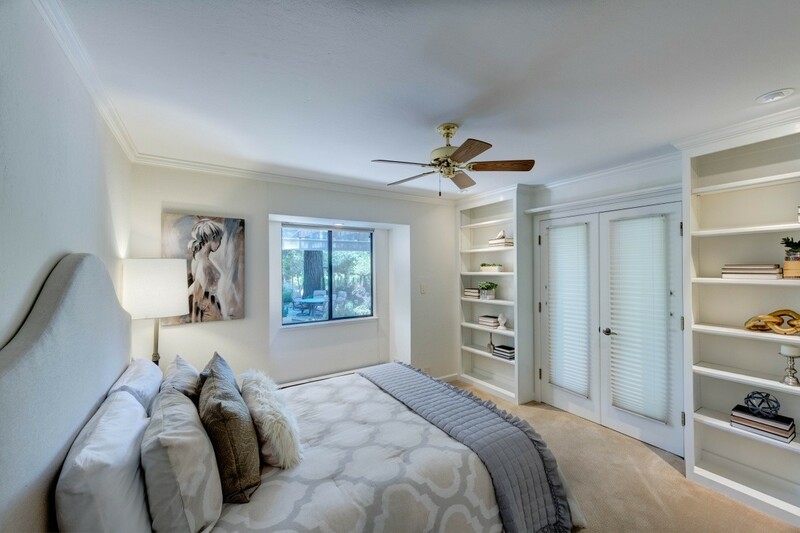 3rd bedroom features built-in book/display shelves, and French doors that lead into the home office. 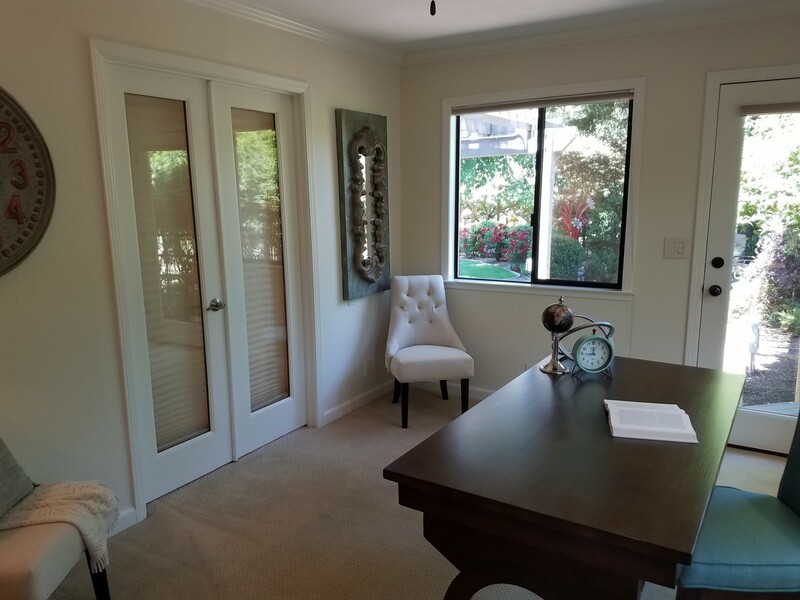 Office French doors to ancillary bedroom. 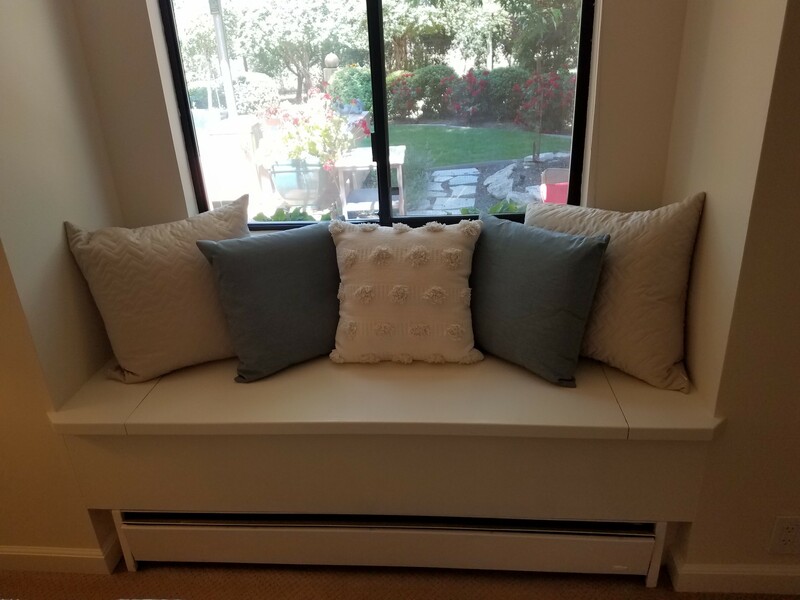 Detail of window seat in 2nd bedroom and view to back yard. 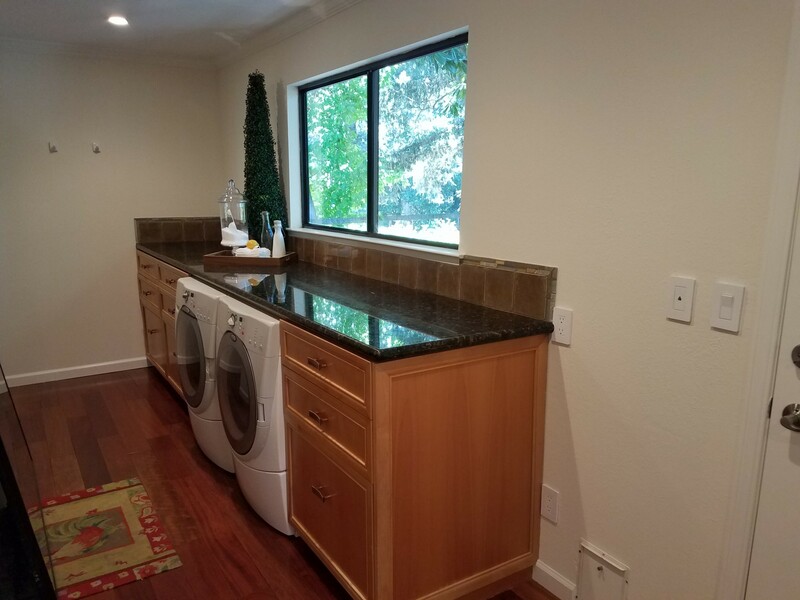 The indoor laundry has an extra long granite counter top over the washer and dryer. 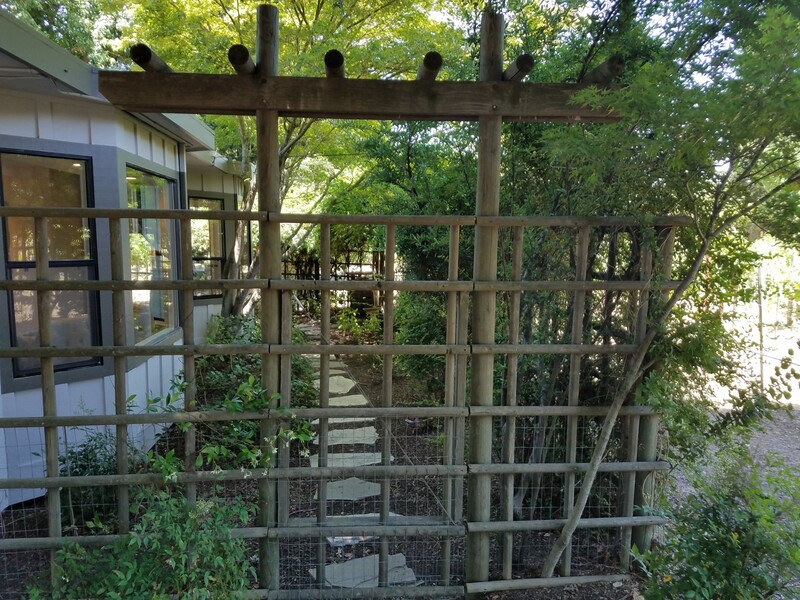 There is a outdoor access to the back yard. 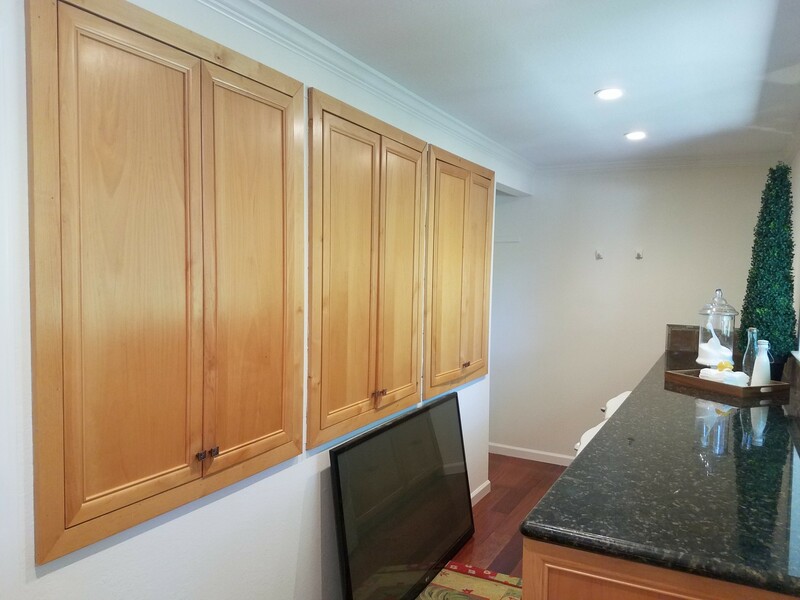 Pantry with slide out shelves, located in laundry room, adjacent to kitchen. 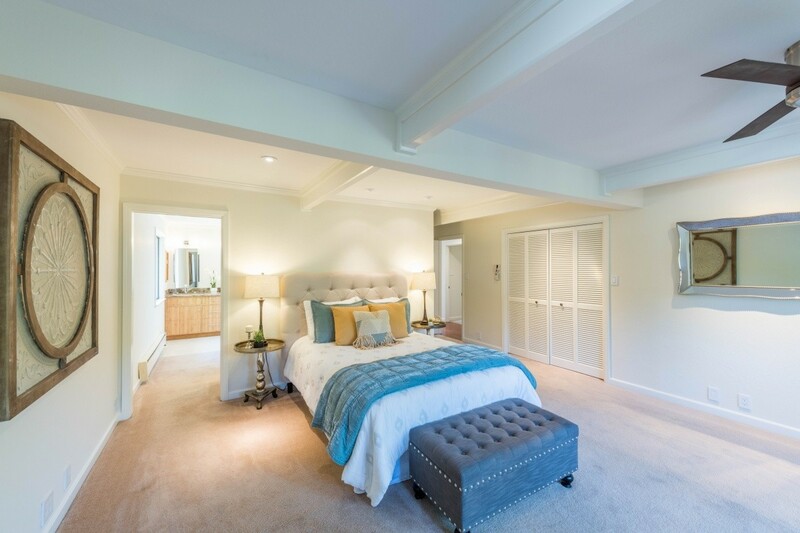 Built-in storage cabinets abound, and room on the end of the room for an extra refrigerator or wine cabinet. 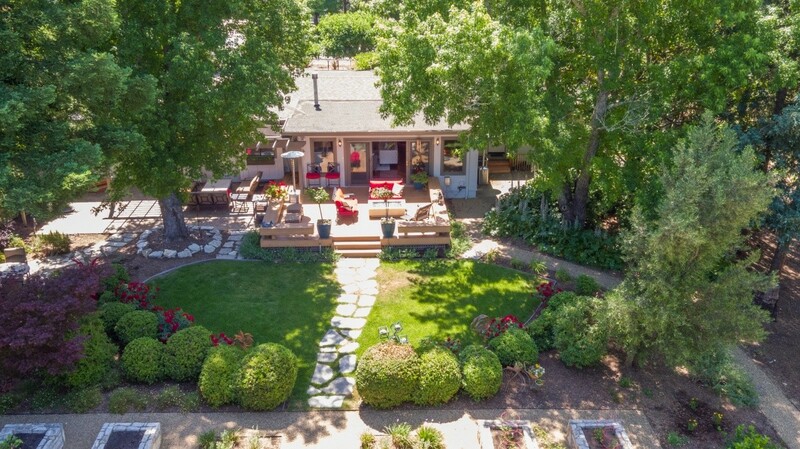 Birds-eye view of the back deck and lawn area. 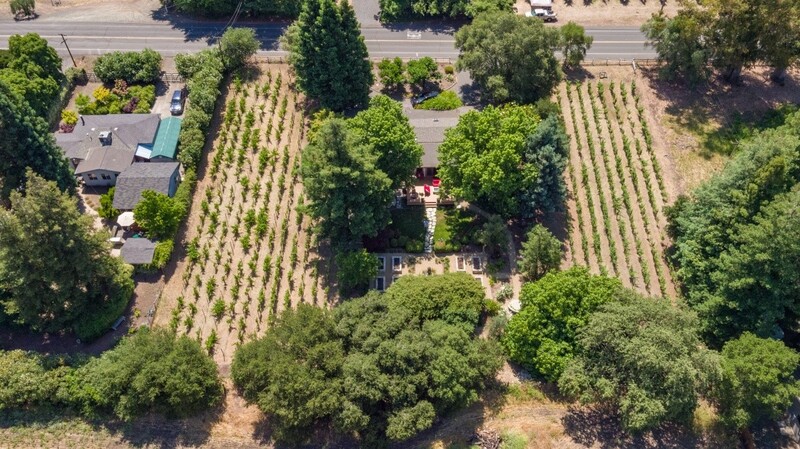 Drone shot of the one acre property, with Cab vineyard to the West, and Merlot to the East. Yountville Cross Road is at the top of the photo. 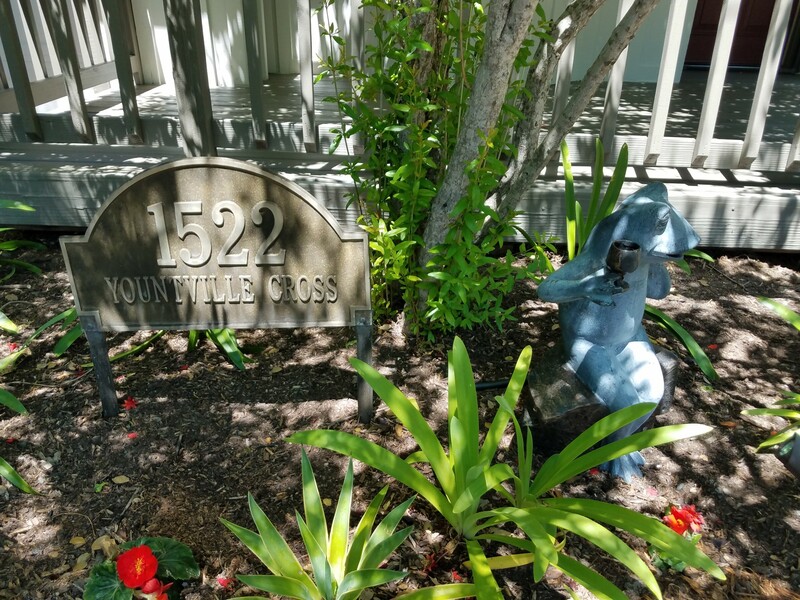 Thank you for visiting 1522 Yountville Cross Road! 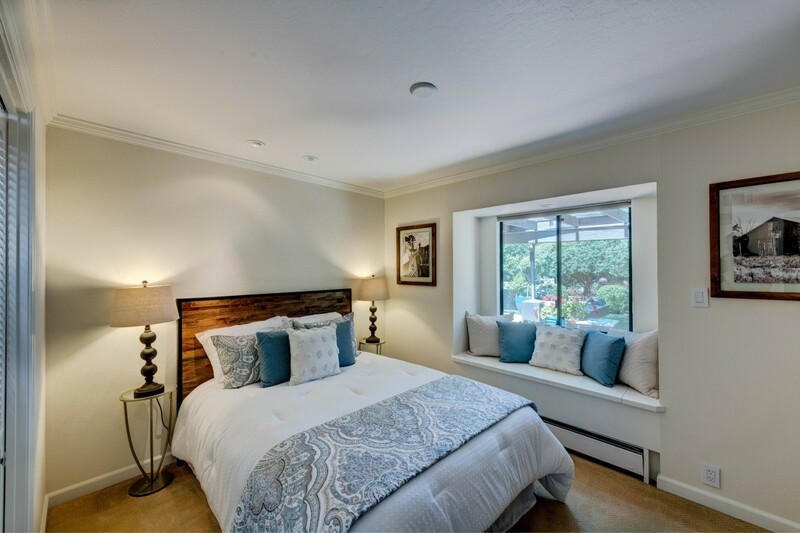 The broker and seller do not guarantee the accuracy of information such as square footage, lot size, architectural images, or other information concerning the condition or features of subject property. Information is deemed reliable, but is not guaranteed. Information may have been obtained from public records and/or other sources, and all buyers are advised to independently verify the accuracy of any and all information through personal inspection with appropriate qualified professionals.